Stoke City kicked off the new year with an impressive performance, but in an open encounter at the Britannia, United would hold on to take a point. All eyes were cast upon the Britannia Stadium for the first game of the 2015. After Robin van Persie was flagged offside after being found by Jonny Evans, Van Gaal's side would see their New Year tarnished within minutes at the hands of Ryan Shawcross. Just two minutes into the tie, Peter Crouch headed towards the defender finding plenty of space to make the simplest of headers into the roof of the net. The Red Devils had let him slip through the net with poor defending for the opener. Any early attempts for United to grasp the game back into equilibrium were phased out. Falcao's cross went into the hands of Begovic, and from the plethora of corners that came in the opening spell, there was a risk of the defenders being frozen in uncertainty. It was appearing to develop a slow-burner situation for United. Stoke waited for the Falcao/van Persie/Rooney tandem to come at them, before eradicating that threat to a low degree of ease. As the corners continued to tumble, Begovic's goal continued to look secure and resolute. Wayne Rooney had a pop at goal from around 30-yards out, but the free-kick drifted away from the Stoke goal. Jonny Evans wiped away the frantic sweat on his brow with a sigh of relief after Mame Biram Diouf squandered a huge opportunity to double the lead. Evans was cut out in the area, and Diouf on the turn blasted it with reckless abandon, expectedly failing to find the goal-mouth De Gea was occupying. Another corner, would lead to another goal. But it was on the end of the trailing side. Swung in by the skipper, Carrick met it first to flick on towards the path of Radamel Falcao. The Colombian swept it in to even the game and bag his 3rd goal for the club. More corners followed, no more goals would though by the interval. Manchester United's performance summed up the game at that point. Albeit entertaining, it was scrappy. Stoke were taking advantage of those typical Potters' conditions. Manchester United's mistakes slowly made their way towards a magnifying glass as Stoke looked to punish them at every opportunity. A mis-communication led to a mixup between Juan Mata and Michael Carrick, but Phil Jones cleaned up to stop Arnautovic latching on to the ball. The second half did however remain in the motion of a fast pendulum. Juan Mata's free-kick was easily palmed away by Asmir Begovic, while Phil Jones headed out for a corner to stop Walters' cross. A few inches to the left and it would've been an own goal. Subsequently, there was a big appeal for a Smalling handball but referee Michael Oliver was reluctant and didn't give the first spot-kick of the year. As both sides realised that three points were in for the taking, the visitors displayed some of the true quality that could take over the game. Juan Mata picked out Robin van Persie, who controlled the ball with his chest before trying to sneak a volley into goal, but it wouldn't even test the keeper. 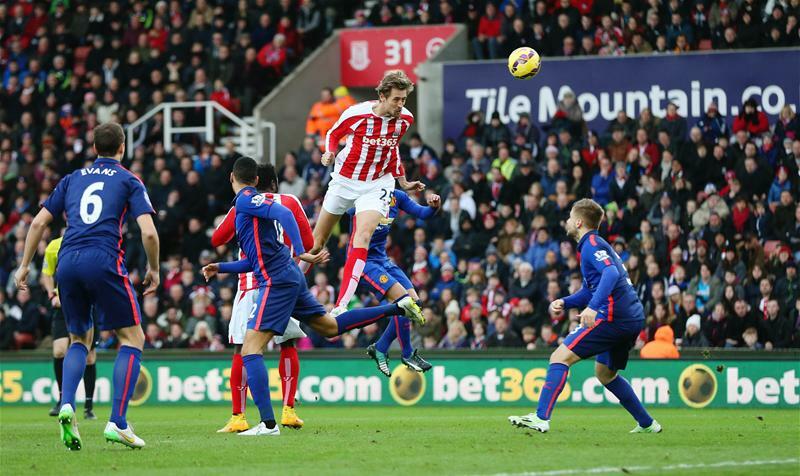 Stoke themselves showed their prowess and intentions when Peter Crouch made hearts race for United. He glanced a header from a corner which rattled the post, and on the rebound Walters smashed it over. Diouf's volley was deflected for a corner, United found themselves up against the ropes until they cleared. But, with so much more time to go, the battle was boiling. Ashley Young was looking to race away and produce a chance when he nursed a hamstring injury. The English winger pulled up in agony and was replaced by Rafael. Yet another injury dealt to the growing pile to Van Gaal. United's panic and discomfort was epitomized by Phil Jones heading out for a corner of which could've been easily avoided. It appeared to be going out unscathed for a goal-kick, but Jones was not prepared to take any risks. With more space opening up by the minute, the crowd getting louder and fatigue from the hectic Festive Football schedule wearing on, Shawcross had a go from more than 30-yards and it soared into the stands. Diouf got into the box soon after for Stoke but he couldn't pull the trigger. On the other end, a Rooney header opened up for a Rafael chance, but skidding in the attempt, it went out for a corner. There were two minutes of added time, with Mata's cross being pushed out defiantly. Assaidi charged towards goal but his shot was caught by De Gea, and that was it. A promising Stoke performance couldn't find a hero, but nonetheless it marks the end of a brilliant run in the Christmas period by Hughes' side. Stoke City orchestrate an impressive performance to restrict Manchester United to a draw on New Year's Day.